Like the superhero version of Big, Warner Bros. Shazam has a kid doing everything you or I would do if given amazing powers that also make him look like an adult. I know the first thing I would do is leap off of a tall building, for instance, and scream out SHAZAM!!! so that a lightning bolt gives me the ability to fly rather than splat on the concrete. Honestly, this movie looks like an absolute blast, and I'm digging everything in it. The latest TV spot has a lot of new footage, mostly of Zachary Levi as the titular hero, and Jack Dylan Grazer as his best pal Freddy Freeman. 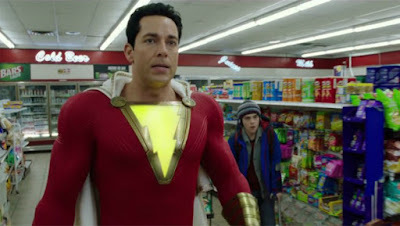 While we do see some new stuff from Shazam's powerhouse brawl with villain Dr. Thaddeus Sivana (Mark Strong), the best finds the hero and his buddy trying to buy beer, and attempting to purchase a lair. Every hero needs his own lair. Here's the synopsis: We all have a superhero inside us, it just takes a bit of magic to bring it out. In Billy Batson’s (Angel) case, by shouting out one word—SHAZAM!—this streetwise 14-year-old foster kid can turn into the adult Super Hero Shazam (Levi), courtesy of an ancient wizard. Still a kid at heart—inside a ripped, godlike body—Shazam revels in this adult version of himself by doing what any teen would do with superpowers: have fun with them! Can he fly? Does he have X-ray vision? Can he shoot lightning out of his hands? Can he skip his social studies test? Shazam sets out to test the limits of his abilities with the joyful recklessness of a child. But he’ll need to master these powers quickly in order to fight the deadly forces of evil controlled by Dr. Thaddeus Sivana (Strong). Directed by David F. Sandberg with Asher Angel, Djimon Hounsou, Adam Brody, and more co-starring, Shazam opens on April 5th.